If there's been one constant in the Black Ops series of Call of Duty games, it's been Nuketown. With that said, it's time to return there, once more. If there's been one constant in the world of Call of Duty: Black Ops, it's been Nuketown. Nuketown was one of the more popular multiplayer maps for its small size and its design that kept the action moving at a breakneck pace. It returned with a new coat of paint as a pre-order bonus in Black Ops 2, so why shouldn't it come back for a third go-around? The suburban setting will now fast-forward to 2065 and go under the name Nuk3town, retaining many of the elements of the previous two Nuketown maps. However, it's also undergoing some unspecified refinements to help it fit in with the newer, more fluid movement that's being introduced with Black Ops 3. 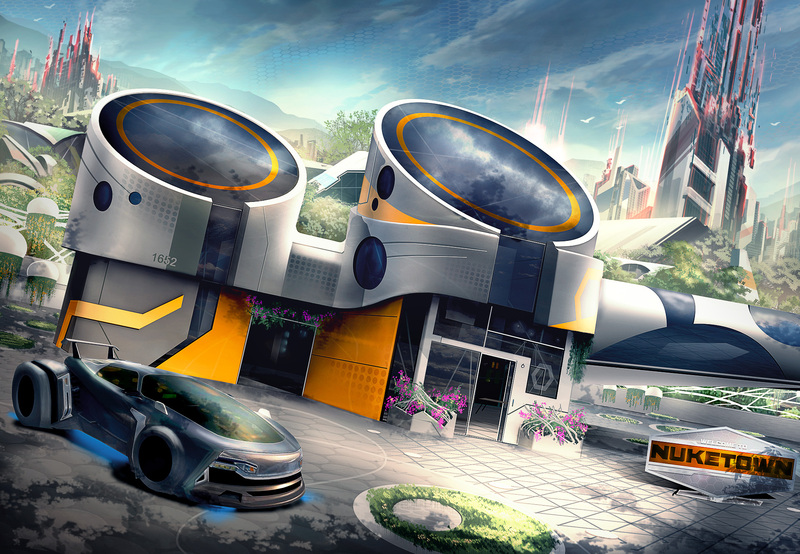 Just as was the case with Black Ops 2's Nuketown 2025, Nuk3town will be included with Black Ops 3 as a pre-order bonus. Call of Duty: Black Ops 3 is set to hit on November 6. For more, check out our impressions of the recent multiplayer beta. I wish I could import the Hangouts sad face because it's the most soul-crushingly sad sad face I've ever seen and that mirrors my reaction to nuketown's return. Ugh. I wish maps like this would die, but I know like 50% of the community will only play this map and forget the rest. It's so weird. I know part of it is because of the ranking system and farming xp, but this style of maps has been around forever, before ranking and xp was a thing. Thinking about ut2k4, the "funmaps" style was far more popular than the real good and well thought out maps. It just baffles me that people prefer to play maps where the average lifespan is 5 seconds long and there's no where to really run around and maneuver. It's like playing laser tag in a room with no obstacles. Part of the issue with it too is that they just put too many players into these types of maps. I've played on some of the smaller "meat grinder" maps in AW (Urban, Comeback, Sideshow etc) with like 4-6 people before and they're actually much much better that way. It's when you get the full servers that it turns into an instant death right at spawn shitshow. Worst one of these though was the Shipment map from the original MW - you'd die like 10 times in a row before being able to even get out of the 100% defendalbe spawn point death traps people would set up. shipment was definitely the worst. back then CoD had really op grenades so people would just chuck them from spawn towards the other spawn. instant death over and over. Are they going to take it away after a few weeks and make it a "sometimes" map again? Assholes. I've been tagging along behind InfoBiter the last couple days and, you know...it's pretty fun. I'm terrible at it, but I have a moment here and there and it's enjoyable. I'm kind of wishing there were a way for me to opt out of Nuketown with my preorder so I wouldn't have to deal with it. Nuketown had one purpose and that was a stupid 1v1 LAN map for my brother and myself to play on when we didn't have broadband (back in the first CoD Blops). Barnstorm in SoF2 got used the same way.